The Eucharist is the Source and Summit of our very lives. It is the source by which we have life, and it is the summit to which our lives are directed. What a beautiful opportunity to participate in the Holy Mass! 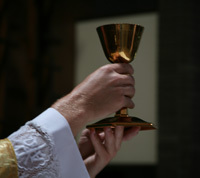 Many opportunities are available to volunteer; whether that be as a Eucharist Minister of Holy Communion (E.M.H.C. ), an altar server, a lector, etc. Scroll down to learn more about our various ministry positions and opportunities. For more information on how to get involved, contact the Ministry & Volunteer Coordinator by calling: 785-827-5575. Moreover, many of God's people are unable to attend Mass due to various reasons (e.g. illness). Volunteer now or request more information by contacting the parish Ministry & Volunteer Coordinator. We at St. Mary, Queen of the Universe are grateful for your service. To view your personal schedule, to request substitutes, to make sub-requests, and to fill open positions login to the Web Terminal by clicking the button below, and enter your username and password. Bring Christ to others. Extraordinary Ministers of Holy Communion bring the blessed Eucharist to those who are unable to attend Mass due to illness, etc. This includes those who are in the hospital, a nursing facility, or private home. Training, orientation and materials are provided. If you would like more information on this ministry, would like to volunteer, or are in need of a volunteer to bring you the Eucharist, please contact the parish Ministry & Volunteer Coordinator. Proclaim the Word of God during parish liturgies. Welcome people as they arrive at Mass, offering a missalette and bulletin. Acknowledge mourners as they arrive at Mass, offering a missalette and memorial folder. Also, indicate the register, Mass cards/envelopes, etc., and help in any way as requested by the mortuary. Provide general care for the items in the sacristy and the altar area. Volunteers work on a rotation schedule, serving two or three times a year. Assist the presider in the liturgical celebration at daily or funeral Masses. Accompany and encourage the assembly to participate in the sung prayer during the celebration of parish liturgies. Help parishioners find a seat, if necessary; take up the collection or find someone to help; and maintain a sense of decorum in the Gathering Area, Cry Room, etc. This is prayer before Jesus in the permanent exposition of the Blessed Sacrament. 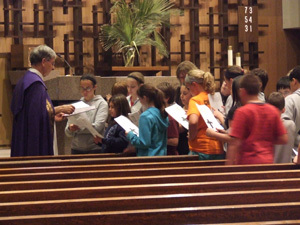 The Chapel, located in the St. Elizabeth Ann Seton Church at 1000 Burr Oak Lane, is open in constant vigil of prayer, 24 hours a day, seven days a week. Ideally, individuals are asked to commit to spend one hour a week in prayer. Prayer requests are passed along by phone call or email with the confidence that they will only be shared with those who have committed themselves to pray for others in the privacy of their homes. Names will remain on the prayer line for one month unless requested otherwise. Requests may also remain anonymous if you so choose (e.g. "I would like ______ to be prayed for by the prayer line."). If you have a prayer request, please contact Angie Holston, 785-827-3929; or Betty Yockers, 785-827-2966.